We’d love your help. Let us know what’s wrong with this preview of Himalaya by Ruskin Bond. Intimate, exhilarating writings on adventure, meditation, and life in the captivating wildness of the Himalayan Mountains—with contributions from Amitav Ghosh, Mark Twain, Rabindranath Tagore, Peter Matthiessen, and more. For some, the Himalaya is a frontier against which people test themselves. 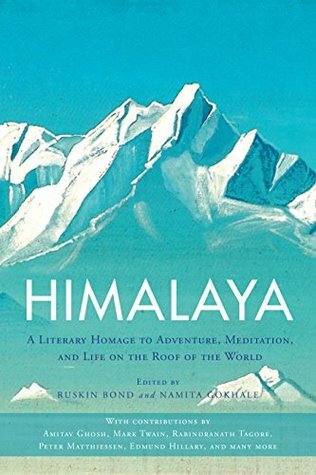 Others find refuge and tranquility in the mountains, a place where they can see Intimate, exhilarating writings on adventure, meditation, and life in the captivating wildness of the Himalayan Mountains—with contributions from Amitav Ghosh, Mark Twain, Rabindranath Tagore, Peter Matthiessen, and more. For some, the Himalaya is a frontier against which people test themselves. Others find refuge and tranquility in the mountains, a place where they can seek their true selves, perhaps even God. Over millennia, the mountains have cradled civilization itself and nurtured teeming, irrepressible life. With over thirty essays, this exhilarating anthology offers a dazzling range of voices that reveal accounts of great ascents and descents—from reflecting on a deadly avalanche to searching for a snow leopard and enjoying the simple pleasure of riding a handcar down a railway track. These diverse writings bring to life the spirit of the Himalaya in an unparalleled panorama. To ask other readers questions about Himalaya, please sign up. Some pieces stronger than others, but nevertheless a gripping collection that spans centuries. The emperor Jahangir reveals himself to be an astute observer and bon vivant. An excellent take and all about Himalayas. The most gripping chapter was Hilary's final lap towards summit - the Everest.